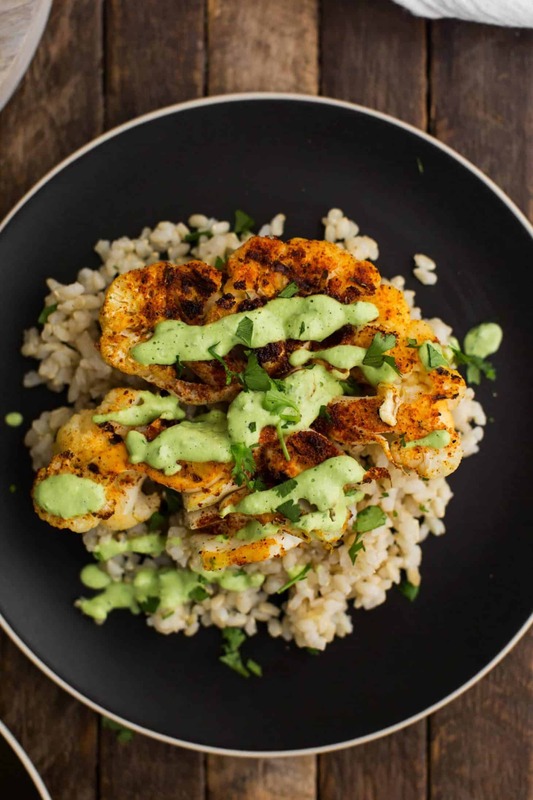 Cajun Cauliflower with Cilantro Avocado Sauce | Naturally. Post sponsored by Bed Bath & Beyond. See below for more details. In the transition to fall, there are certain foods I gravitate towards such as warm stews, stick-to-your-rib meals, and spice. This cajun cauliflower uses one of my favorite spice combinations, also labeled as blackened seasoning. I enjoy the seasoning because it’s smoky, spicy, and the perfect compliment to cauliflower. In fact, you can easily purchase a blackened/cajun seasoning. But, if you have a well stocked spice cabinet, you could probably whip up a batch of seasoning. Beyond the seasoning, when I make cauliflower steaks, I like to steam the cauliflower before grilling. 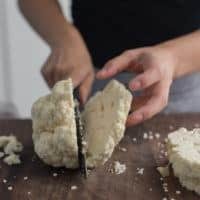 This helps to take the raw edge off the cauliflower so the final texture is perfect. 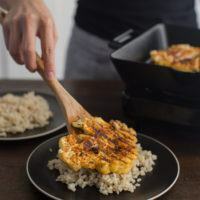 Also, the pre-seasoned cast iron grilling pan from Bed Bath & Beyond’s Artisanal Kitchen Supply is perfect for this recipe! For one thing, you to get the char just right on the cauliflower! 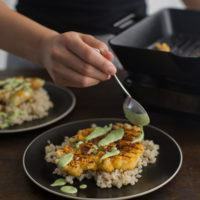 A beautiful vegan recipe that features cajun seasoned cauliflower steamed then grilled and topped with an easy avocado cream sauce. Soak cashews in 1 cup of water for 30 minutes. Pour soaked cashews and water into a blender (see note). Puree until smooth, adding water 1/4 cup at a time as needed to get the consistency you prefer. Add avocado, cilantro, lime juice, salt, and garlic. Pulse to combine sauce. Set aside. Next, cut cauliflower in half. Slice two 1/2-inch thick steaks. Fill a large pot with water until there is about 1/2-inch of water on bottom. Place steamer basket inside. Then bring water to a boil over medium heat. 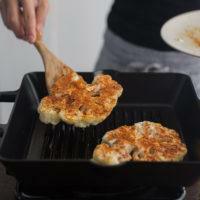 Place both cauliflower steaks inside steamer basket. Cook until just tender, 4 to 5 minutes. Remove from pot in order to let cool on a plate. 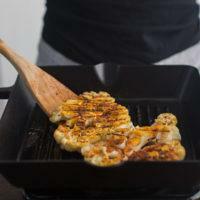 Drizzle 1 tablespoon of olive oil on each cauliflower steak. 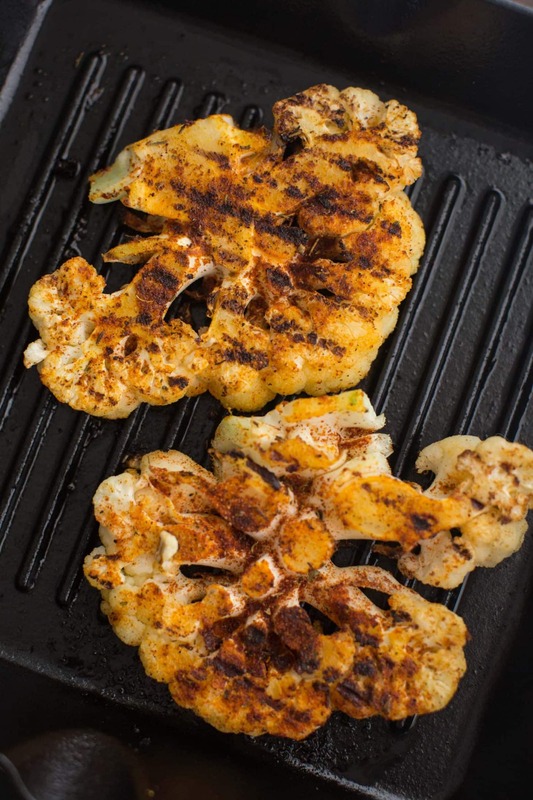 Rub oil over each side of the cauliflower steaks. Then sprinkle 1/2 teaspoon of cajun seasoning on each side of both cauliflower steaks. Heat cast iron grill pan over high heat. Add 1 tablespoon of olive oil. Sear the cauliflower in pan until charred, about 3 minutes each side. 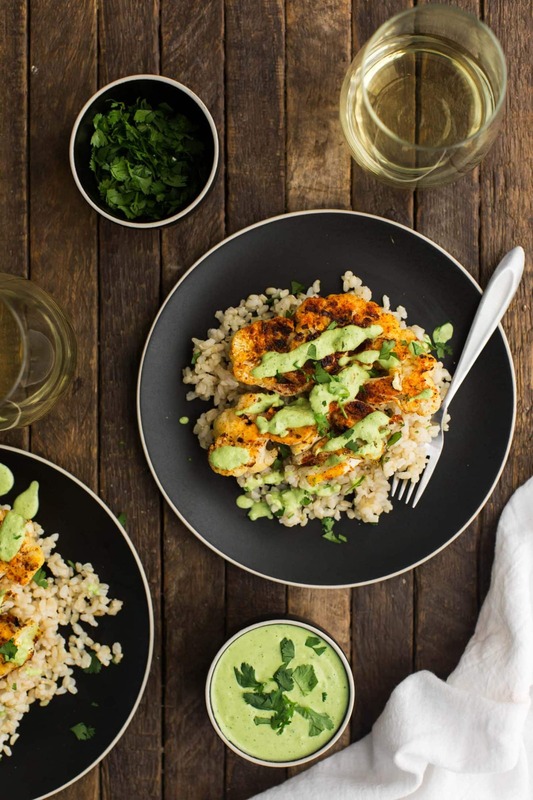 Serve seared cauliflower over a bed of brown rice. 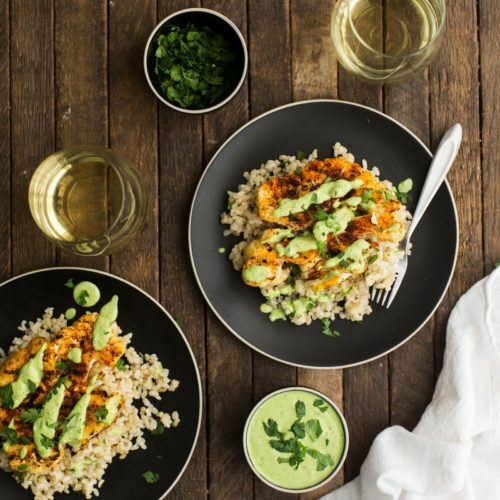 Top with cilantro avocado sauce. Tips & Tricks: You can buy blackened seasoning or Cajun seasoning instead of making your own. Be sure to use a high speed blender to make the dressing in order to achieve a smooth consistency. I think what I love most about this recipe is that it’s vegan without trying to be. The sauce is creamy as a result of the cashews and avocado. In fact, one might think there’s dairy in it. However, a word of caution that some cajun/blackened seasonings are spicier than others. For this reason, be sure to test it out with a bit of olive oil and bread to see if you’ll like the flavor and heat! Roasted: You could roast the cauliflower with the cajun seasoning instead of preparing steaks. In this case, cut 1 head of cauliflower into 1-inch florets. Then, toss with 2 tablespoons olive oil and 1 1/2 tablespoons cajun seasoning. Finally, roast at 400° F for 30 to 45 minutes. Topping: In order to add some crunch, sprinkle toasted cashew pieces on top. 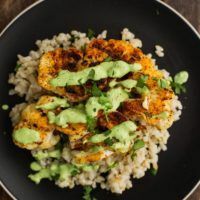 Grains: In this case, the cajun cauliflower can be served over any leftover grains. For example, try it with millet or quinoa. This looks just delicious! 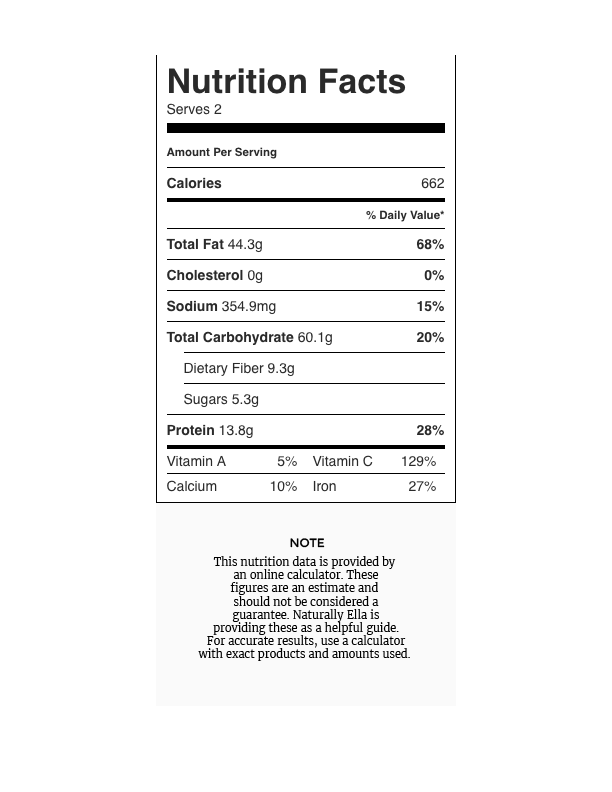 We love cajun seasoning in our house and when we went vegetarian, it felt like we didn’t get it very often. My husband will be excited about this meal! 😀 Thank you for all that you do. Hiiiii. *shuffles feet* I’m one of those pesky people that thinks cilantro tastes like soap. Would you have an alternative sauce for this? This looks amazing!!! 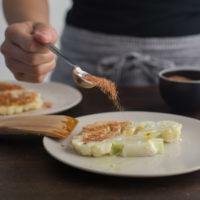 I’ve been looking for some new recipes since I quit eating carbs and this looks like it will hit the spot! I’m so crazy on avocado and your pictures encourage me to try this myself! Really fun healthy option! This looks absolutely mouth-watering good to me. And BTW I love the look of your blog. It is really well done and visualy stunning. This looks awesome. However, my son is allergic to most nuts (except almonds), do you think almonds would work as a replacement? Or, do you have another suggestion? I made this last night, and it was delicious! However, I ended up doubling the sauce because it seemed very runny. But, in retrospect, I think that may be my mis-reading of the recipe: do you combine the soaked cashews, *and* the soaked cashew water in the sauce? Then, even potentially more water?